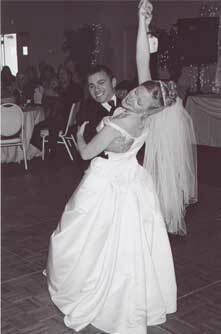 Learning to dance for your wedding is a special gift that you and your fiance give to each other. Feeling confident and poised when you dance together will ensure that your very first dance as husband and wife will be a memory you and your guests will cherish forever. Let us choreograph a unique routine that suits your needs for your first dance as husband and wife, a father/daughter dance, a mother/son dance, or even a special line dance for everyone to join in. Packages start at $200 and include four 45-minute private lessons and a choreographed dance to the song of your choice. 1. Don't wait until the last minute: Remember that your schedule will get very hectic as your wedding day approaches. Dance instructors recommend starting three to four months earlier to allow more time for practice, especially if you are new to dancing. 2. Remember that dance lessons can actually be a stress reliever: Dancing is good exercise. Setting aside time for dance lessons can pull you out of the hustle and bustle of the day to spend an hour or so with your fiance, having fun together. 3. Choosing a dance style or song: Be creative in choosing a song that has special meaning to both of you. If you have already chosen a song (or a few choices), make sure to let your instructor know about it before your first lesson. If you are unable to bring in a hard copy of the song, make sure you let your instructor know ahead of time so they can be prepared for your lesson. 4. Be patient when learning: Dancing is a great stress reliever, and a fun date night, so don't put too much pressure on each other, or yourself. 5. Don't try to teach your fiance: You'll both have a lot more fun dancing if you let your instructor do the teaching. 7. Have the answers to these questions before your first lesson: What is the size of your dance floor? Will you be dancing to the whole song or have people join in? Who will be playing your first song (Band or DJ)? How will you walk in to the dance floor?